Brander had been in Greater Western Sydney's academy since he was 12, but as the AFL begun to consider realigning the Giants' vast zone, the teenager's place within it became a big point of conjecture. 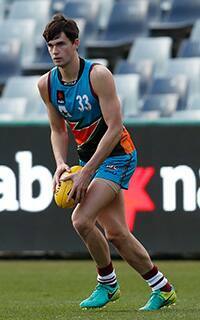 In the end, the AFL restructured the Giants' academy region, and Brander was excluded from it. Suddenly, one of the leading key position players in the pool was available to the whole pool. Brander played at both ends of the field throughout 2017. Despite not being eligible to join the Giants as an academy selection, he did feature in their academy series side earlier in the year before playing for the Allies in the NAB AFL Under-18 Championships. Brander is a good overhead mark who has the ability to have a commanding influence on a game. We saw that most prominently when he played for the Allies against Vic Metro, steering his side to a surprise win with three goals. That day at Simonds Stadium he played with presence, leapt at the ball confidently, and was agile around the ground. He's also able to play as an intercept marking defender, and has shown the ability to read the play well and get into the right spots to cut off forward forays and get the ball going his team's way.